In 2011, the American Daffodil Society designated a new exhibition section for any daffodil registered between the years 1940 and 1969, inclusive named “Classics”. The American Daffodil Society believed that such a section would interest a different segment of exhibitors and might encourage bulb growers to keep these post-war era cultivars available. The American Daffodil Historic Daffodil period ends at a milestone in history, World War II, when marketing and exporting daffodils temporarily ceased. When trade resumed, daffodils were different, improvements in form were most noticeable. These daffodils of the postwar period pre-dated have brilliant red-cups in many divisions. There was the elegance of vivid reverse bi-colors, the nicely-formed split coronas, the growing acceptance of doubles, and the appearance of “upper divisions” in major collections. In other words, the daffodils we exhibit today. 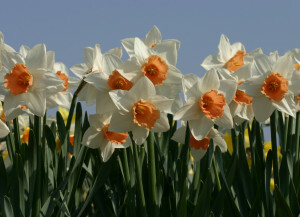 The year 1969 was selected as the cut-off date of this period in daffodil hybridizing development, and best marked their difference. There are well over 9,000 Classic Daffodils. Because of this high volume, there is no official list. However, DaffSeek.org recognizes Classics with the phrase “ADS Classics” on the detail page for daffodils with a registration date between 1940 and 1969, inclusive.